The Factory is Berlin's biggest and fastest growing start-up campus. It brings high-class technology businesses together with early stage startups and talents by providing a work environment, a curated community of founders and quality events. 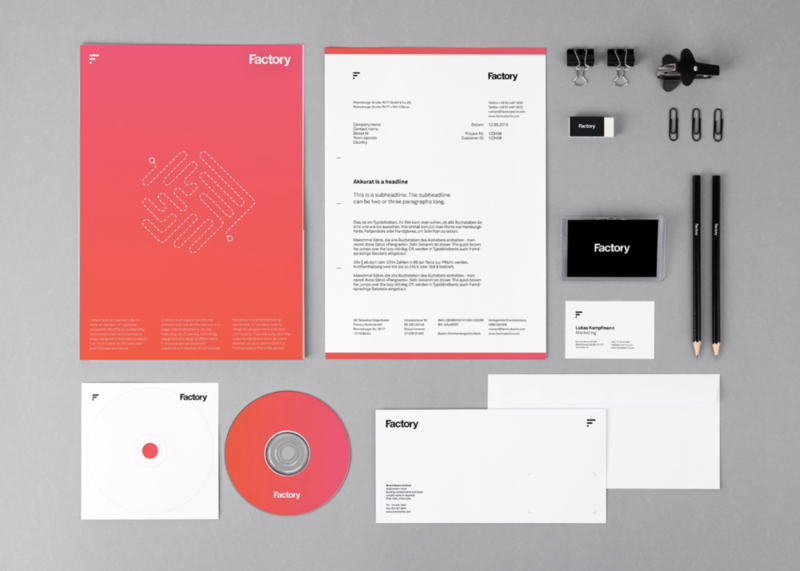 The Factory already owned a tentative visual identity consisting of the word mark Factory and a stylelized F as figurative mark. Since these elements were already heavily recognised by media the new corporate identity had to gently adapt the existing characteristics and navigate the brand to a more elaborated visual identity. The word mark and figurative mark. Usually the width of the Factory icon should be used as a margin for the space to the boarders of the medium. The iconic mark is aligned to the height of the capital F of the lettering. The word mark is the primary element of the Factory’s identity. It can stand alone, while the figurative mark should always be combined with the Factory slogan on the same media. The logo needs whitespace to feel light and generous. The Factory is neutral and timeless. The Factory is communicating clear and direct, but never screaming or selfish. The word mark is the face of the Factory. It's the main branding element and represents the entire Factory cosmos including it subbrands. To represent this attitude visually the word mark is set in a customised version of the Helvetica Neue bold. Factory is set in in lower case with a capital F.
The figurative mark is the iconical representation of the Factory brand.It’s used in addition to the word mark. It can be used individually, but is the secondary element representing the Factory. The figurative mark represents an abstraction of the letter “F”. While representing the Initial of the Factory it also symbolises the modularity and growing character of the brand. The logo is build of geometric squares in a simple, logical setting. It uses only filled elements and can therefore be inverted easily. The heart of the layout, the soul of the message. It therefore is crucially important that the typography is clean, objective and functional. Yet It has to have a modern and friendly feel. The typography is like your favourite coffee mug it just delivers you, what you want in the most convenient way. The typography is the most important layout element. When the design is the body the typography is the body-language. It delivers clearly and neutrally the Factory’s message to the recipient. A modern approach of a golden veteran. Being the most used type in all time the Helvetica can be called the most honoured veteran of the golden age of grotesk fonts. The Akkurat builds upon that and relies on the waterproof character of the Helvetica typeface riddled with a modern character and ready to be displayed on any screen. With the famous DIN type as a second fundamental pillar the Akkurat has a bigger tracking and bigger X-height, but keeps nearly the same width, which makes it optimal for screen usage and keeps high readability in small sizes. The fontface that tells feelings, not facts. The Parsley script font is the playful antagonist of the Akkurat. It’s the child in us, joyful and human and can be even a bit naive. It's used to express feelings and only appears in buzzwords or very short phrases. While the Akkurat mainly appears in black the Parsley is set in Blush Red. The Blush Gradient combines the Blush Red with a pinkish nuance. It’s used to fill shapes or backgrounds. When applying the Bright theme. It should be used with great care and really rarely as a vitamin shot in the mostly colourless layout. The primary colour palette of the Factory gives room to it’s layout with a lot of whitespace contrasted with black text and graphical assets. It highlights important elements with the Blush Red. The cherry on the cake. Texts, photos and graphs are the main tools to transport information in a presentation. But beside these primary elements, illustrations and doodles can ease the layout and entertain the reader. They can be used for titles and transitions. For these purely entertaining elements a more flexible grid and colour scheme is used to ensure creative freedom and joyful designs.